As the quality of transactional data in the real estate markets improve, sifting through the series of data points has led to an ever increasing insight into the nature of buying and selling. More importantly, it has allowed for the gauging of investor and end-user sentiment along with their preferences, and provided further clarity into the health of the overall market. Dissecting the data by community has shown certain relationships between price and volume, and enabled analysts to forecast with increasing accuracy what trends are likely to be seen. After the introduction of higher transfer fees by the Dubai Land Department, there has been a noticeable drop in transaction volume in freehold communities. Depending on the area being looked at, volumes have registered a drop of between 5 per cent (International City) and 30 per cent (Arabian Ranches) in the six months after the introduction of the higher levy. While this measure was needed to dampen the possibility of any speculative froth developing, it throws up another interesting and symbiotic relationship; that of transaction volume and the resultant impact on price. An analysis of the data reveals that from an overall perspective, there is a strong correlation between city-wide transactions and price action, where the former is a leading indicator. Dissecting the data into various sub-communities shows the same relationship being observed in the high-end communities of Palm Jumeirah and Dubai Marina (correlation coefficients are in excess of 0.5 levels), whereas the correlation is lower in the mid-income communities like International City and Jumeirah Village (statistically insignificant from zero). Historically, transactional data have always been a leading indicator for subsequent price action (transaction volumes rose four months prior to the markets bottoming out in Dubai), and the recent drop off in transaction volume suggests a levelling off of prices in these areas. And in some cases, even a moderate decline in the coming months as markets consolidate. The relationship is expected to hold the strongest in areas where there has been a combination of high price run-ups, coupled with new off-plan offerings. One more factor that sheds further insight into the health of the market is the overall turnover of stock, defined mathematically as the velocity of the community, or the number of times the overall supply changes hands in the course of a year. The higher the velocity, the higher the element of speculative activity in the market, and thus the greater the cause for concern. By this yardstick, the velocity levels for the overall market is 25 per cent below the peak levels reached in 2008. 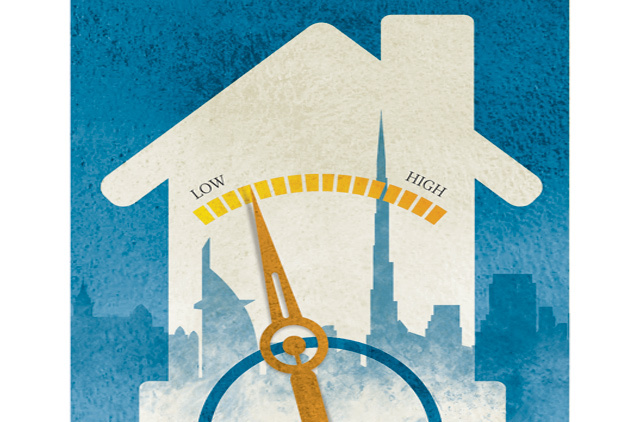 In fact, in many areas associated with high levels of homeownership (Palm Jumeirah and Emirates Living), these have declined by more than 50 per cent from their peak levels. This is a healthy sign and perhaps the strongest indicator along with the mortgage data that suggests that a stable housing base is being formed in these communities. It is important to note the “element of noise” in the analysis, and other multiple variables that have an important role to play. Clearly, prices have run up significantly in the last two years, and in many cases have exceeded the 2008 peak levels, prompting concerns of affordability. Added to this, developers have stepped up and offered a plethora of off-plan options as they gear up for the next building boom and a significant amount of liquidity has diverted to these purchases. This phenomenon was not as significant a factor in the first-half of 2013. The bright star remains the affordable real estate segment. Across mid-income communities from International City to Discovery Gardens to Jumeirah Village, there has been a marginal impact, if any on volume in the recent months. The data suggests that prices in these areas will continue to rise, especially as rents continue to spiral higher. Perhaps most interestingly, even the velocity levels in these areas have declined, though the common perception has been that mid-income areas have been favourites for speculative activity. Transactional data indicates quite the opposite; yet again demonstrating the dearth of supply relative to demand in this segment. Developers will do well to pay heed to these data signals and amend their offerings to cater to this relatively underserviced, but lucrative, slice of the market.